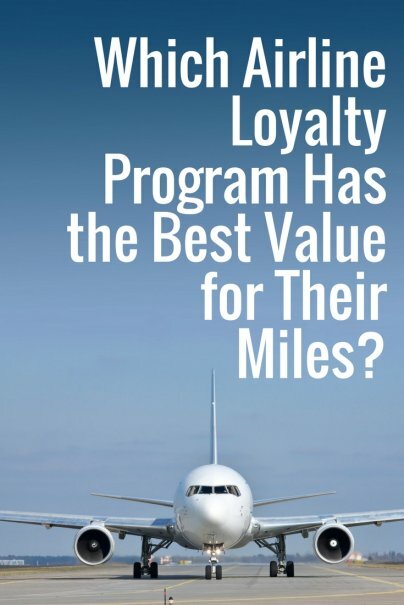 Which Airline Loyalty Program Has the Best Value for Their Miles? Home » Personal Finance » Credit Cards » Which Airline Loyalty Program Has the Best Value for Their Miles? It can be really hard to place a value on airline frequent flyer miles compared to other types of credit card rewards. For instance, we all know how much cash back offers are worth, and most other rewards points typically offer a fixed value, often one cent per point towards merchandise or gift cards. But the value of travel rewards miles depends on the carrier as well as which class you're flying. 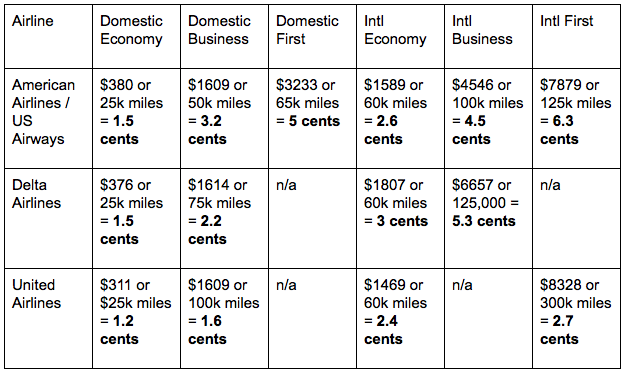 Also, international flights will net you a much higher value per mile. On the international side, American offers few economy class awards and barely any business class award seats at the lowest mileage levels. Worse, its partner British Airways imposes huge fuel surcharges on award tickets that cost travelers nearly as much as an economy class ticket. Nevertheless, American miles are good for redeeming flights from other OneWorld partner carriers which get about three cents per mile from international economy class awards, about four cents in value from business class travel, and even more when booking awards in international first class. 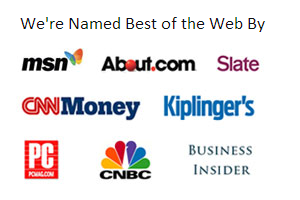 American's award chart offers better value than its competitors. Delta has gone through several rounds of devaluation, which is when they change their award chart to ask for more miles. Furthermore, Delta has the worst reputation for offering vanishingly few award seats at the lowest mileage levels, and few award seats from its partners Air France and KLM. To top it all off, Delta's award search engine offers very unreliable results, which makes booking an award an exercise in frustration. Travelers also have to find a return flight, since Delta doesn't allow one-way awards for half price. Therefore, I would value SkyMiles at one and a half cents for domestic travel in economy class. It's even very hard to find more than two cents in value per point in international business class, except for those who travel alone and are extremely flexible and persistent. When it comes time to redeem miles, United's domestic award availability is not nearly as good as American's, but it's far better than Delta's. So I value their miles at 1.5 to 2 cents each for domestic economy class travel. And now here's a helpful chart to compare all the data above. *Domestic data based on one RT ticket from JFK (New York) to LAX (Los Angeles). International data based on one RT ticket from LAX (Los Angeles) to CDG (Paris, France). These smaller or regional airlines don't offer the great miles programs of the larger carriers, but there are still deals to be had. Each point in Southwest's Rapid Rewards program is worth 1.4 cents each towards flights in its "Wanna Get Away" fare class. Southwest also offers free checked bags and no change fees, so there's additional value in their seats. Alaska Airlines's frequent flyer program is much like the major legacy airlines, and it has quite reasonable award availability and some great partnerships. I would value their miles at about two cents each for domestic and international economy class travel, and four cents each for business and first class travel both domestically and internationally. JetBlue's points tend to be worth about 1.5 cents each towards their fares, but sometimes slightly higher or lower. Points are worth 2 to 2.5 cents each towards flights. Points tend to be worth just about 1-2 cents each as cardholders now have to pay for both checked and carry-on bags, even on award tickets. Unlike other reward cards, there is never just one airline mileage card that can offer the best value for everyone. Those who have the most flexibility and travel as a single or a couple, can often find great value with the major airlines that have finite award seats. Otherwise, families who travel in larger groups and have less flexibility need a program that doesn't control awards so tightly. And of course, where you live and travel will often dictate which airlines that can most conveniently reach your destination. But by understanding the value of each airline's loyalty program, you can choose the one that will give you the most value.